Does Avon Cellu-Break 5D Cellulite Treatment Review Work? Are you ready for swimsuit season? 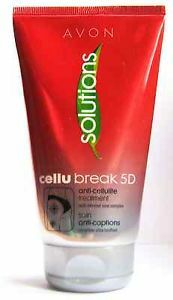 The manufacturers of Avon Solutions Cellu-Break 5D Anti-Cellulite Treatment claim they can get you there. Their anti-cellulite cream which reportedly works "2 times better than caffeine" promises to give you smooth, dimple-free skin right on time for summer. But does it live up to its claims? We take a look at this cellulite cream in our review below. We were surprised by what we discovered - and we think you might be, too. The manufacturer's website boasts that the contents of each tube of Avon anti-cellulite cream, with "Shea butter and soybean extract", works twice as well as caffeine. This statement might lead consumers to think that Avon's cellulite cream doesn't contain any caffeine at all. However, it is hard to confirm this, since the manufacturer is very careful not to advertise their full list of ingredients on their website (or on any third party vendor websites). For best results, Avon suggests that you rub the cream onto your skin twice per day. They specifically mention applying the cream to cellulite-prone areas of skin, such as your abdomen, thighs, buttocks, and hips. But they neglect to say how long it takes their product to work - will you start to see improvements in cellulite appearance in two weeks? Four? Six? Basically, you'd have to buy the product yourself and find out the hard way. How Much Does Avon Cost? The manufacturer of Avon Solutions Cellu-Break 5D Cellulite Treatment is currently selling their cream for $29.99 for a 150 mL tube. You can find it on other websites for even cheaper, but you don't necessarily get the same guarantee of product quality that you would get when ordering from the manufacturer. It's hard to say for certain whether or not Avon's anti-cellulite cream is a product worth buying. For starters, it's nearly impossible to find a comprehensive list of ingredients, or even a shortened list of their most effective ingredients, other than shea butter and soy extract. And yet, somehow, these two ingredients are supposed to be more effective at banishing cellulite than the much more well-established ingredient caffeine. However, each tube of product retails for less than $30, so if you do try it and it doesn't work, it won't be as devastating as wasting money on an anti-cellulite cream which costs 2-3 times as much. Of course, Avon isn't the only producer of cellulite cream out there. We've reviewed dozens of the top products available, and you can get more info on those, plus our top picks, by reading our reviews section.